The business of "mining" new cryptocurrencies using high-powered computers is no longer profitable for the cryptocurrency ethereum. The profit per month of mining ethereum using a graphics card called a GPU is down from about $150 last summer, to an estimated $0 for November of this year, according to analysis by Susquehanna. Chipmaker Nvidia is also losing money as a result. Susquehanna semiconductor analyst Christopher Rolland says the company's cryptocurrency-related revenue will be "likely close to zero" for the third quarter. Cryptocurrency mining isn't what it used to be. Last year, the "mining" process of earning new cryptocurrencies using high-powered computers, then selling those digital assets, became a profitable side business for savvy entrepreneurs who set up the mining rigs in their basements and dorm rooms. But that side-hustle is no longer profitable if you're mining for the cryptocurrency ethereum using kits containing GPUs (graphics processing units). The profit per month is down for mining from about $150 last summer, to an estimated $0 for November of this year, according to analysis by Susquehanna. In mining, machines run 24 hours a day, competing against other computers around the world to solve complex math problems. The first computer, or multiple computers, to solve the problem earns a fixed amount of bitcoin or ethereum. The "hashrate," or speed at which a computer can complete that operation fell drastically for ethereum this year. A higher hashrate is better for miners and adds to the opportunity of finding the next "block" and therefore getting the reward of new cryptocurrency. The value of ethereum meanwhile has dropped more than 70 percent this year, trading near $205 Tuesday, according to data from CoinDesk. 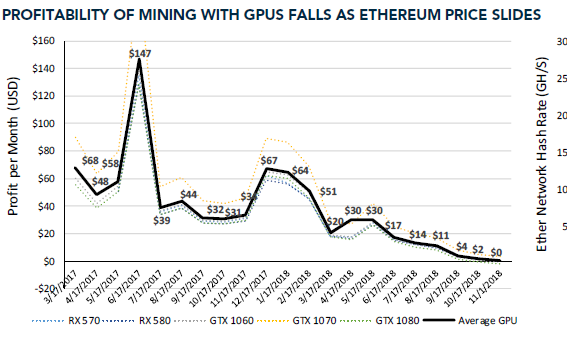 The combination of those factors means that mining ethereum using a GPU, Nvidia's flagship graphics card, is "no longer profitable," Susquehanna semiconductor analyst Christopher Rolland said in a note to clients Tuesday. Chipmaker Nvidia is losing sales as a result. The company's crypto-related revenue is down roughly $100 million quarter over quarter, Rolland said. He predicted that the company's cryptocurrency-related revenue will be "likely close to zero" in its third-quarter report out Thursday. "We estimate very little revenue from crypto-related GPU sales in the quarter, consistent with management's prior commentary that they were including no contribution from crypto in their C3Q18 outlook," Rolland said. "3Q18 mining profitability continued to decline, as Ethereum prices have fallen more than -70% since the beginning of 2018." Nvidia was a major beneficiary of the cryptocurrency boom late last year as miners relied on Nvidia's graphics cards. That process was a money-maker when bitcoin rose to nearly $20,000 last year, and ethereum rose more than 8,000 percent. But as prices have fallen drastically in 2018, so has the chip-maker's ability to profit off of digital assets. Strength in cryptocurrency mining boosted Nvidia's stock earlier this year. In February, shares surged after its fourth-quarter report, which beat Wall Street's expectations, showed big demand in cryptocurrency. The chip stock has gotten pounded since, especially during the October's market correction. The stock is down 23 percent in the last one month and is now in the red for the year. Nvidia reports third quarter earnings after the bell Thursday. Rolland said the company's earnings report, especially its forecast for the current quarter, is likely to disappoint Wall Street this week. He's upgrading the stock to the firm's "positive" rating from neutral, but still lowered his price target to $230 from $250.